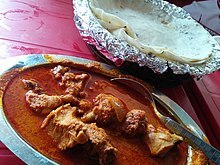 A chicken curry from Maharashtra with rice flour chapatis. Chicken curry is a dish originating from the Indian subcontinent, common delicacy in the cuisine of the Indian subcontinent, cuisine of Southeast Asia, as well as in the cuisine of the Caribbean (where it is usually referred to as curry chicken). A typical curry from the Indian subcontinent consists of chicken stewed in an onion- and tomato-based sauce, flavored with ginger, garlic, tomato puree, chili peppers and a variety of spices, often including turmeric, cumin, coriander, cinnamon, cardamom and so on. Outside South Asia, chicken curry is often made with a pre-made spice mixture known as curry powder. Chicken curry of Tamil Nadu, India. Philippine chicken curry (La Familia, Baliuag, Bulacan). Chicken kasha is a dry chicken curry from Bengal. Indian cuisine has a large amount of regional variation, with many variations on the basic chicken curry recipe. Indian chicken curry typically starts with whole spices, heated in oil. A sauce is then made with onions, ginger, garlic, and tomatoes, and powdered spices. Bone-in pieces of chicken are then added to the sauce, and simmered until cooked through. In South India, coconut and curry leaves are also popular ingredients. Chicken curry is usually garnished with coriander leaves, and served with rice or roti. Even within the country, there are variations among regions. In Northern India, where the delicacy may be cooked with extra spice. Additionally, one can find the dish in several small shops as well as five-star restaurants. Depending on the style of preparation, some versions may be sweeter while others will have a creamier taste to them due to the ample use of butter and cashew nut paste. This dish was introduced to Trinidad and Tobago by indentured Indian workers. At that time, the dish was very similar to the chicken curry dish of India, consisting mostly of sauce with few chicken pieces. However, poultry in Trinidad and Tobago was so readily available, the dish began consisting of mainly chicken, flavored with curry spices. As Trinidadians continued to find their own identity in the world, new curry chicken type dishes began forming. Curry goat and curry duck have become widely popular. Curry chicken and its derivatives are also popular in Suriname, Guyana, Jamaica, Barbados, Grenada, and other Caribbean territories with Indian and South Asian influence. Kaeng yot maphrao sai kai is a northern Thai curry of palm shoots and chicken. There are many types of chicken curry in South East Asia. Although most chicken curry comes from India, some other types come from areas close to India also. But all of its origins begin in India. Different countries, as well as the different communities within these countries, produce variations of the curry. Malaysian curry chicken is usually cooked in coconut milk and often contain potatoes, and there are dry and wet versions. In Thailand, chicken may be cooked in green curry, red curry or other varieties of Thai curry. 1792.—"But now, Sir, a Country Captain is not to be known from an ordinary man, or a Christian, by any certain mark whatever." —Madras Courier, April 26.
c. 1825.—"The local name for their business was the 'Country Trade,' the ships were 'Country Ships,' and the masters of them 'Country Captains.' Some of my readers may recall a dish which was often placed before us when dining on board these vessels at Whampoa, viz. ‘Country Captain. '"—The Fankwae at Canton (1882), p. 33. This dish dates back to the early 1800s. A British sea captain stationed in Bengal, India, shared the recipe for this dish with some friends at the major shipping port in Savannah, Georgia. In 1940, Mrs. W.L. Bullard from Warm Springs, Georgia served this dish under the name Country Captain to Franklin D. Roosevelt (the 32nd president of the United States of America) and to General George S. Patton (a distinguished U.S. Army General). Their warm praise and keen liking and love of this dish were factors in reforging the Southern United States classic status. Roosevelt was so fond of Warm Springs, Georgia, that he built his only self-owned home in Warm Springs. It was a medium-sized, six room cottage, that he liked to call "The Little White House". 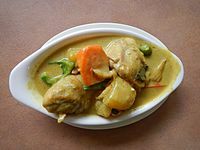 Wikimedia Commons has media related to Chicken curries. ^ Sanjeev Kapoor's Khazana. "Quick and Easy Chicken Curry". Retrieved 10 May 2013. ^ Sanjay Thumma. "Grandma's Curry chicken". Retrieved 10 May 2013. ^ "The Five Most Favorite Malaysian Food". Taste of Malaysian Food. Archived from the original on 2014-04-29. ^ The Hobson-Jobson Anglo-Indian dictionary: A glossary of colloquial Anglo-Indian words and phrases, and of kindred terms, etymological, historical, geographical and discursive. COUNTRY-CAPTAIN to COWLE. Bibliomania.com Ltd.
^ Bunning Stevens, Patricia (October 1998). Rare Bits: Unusual Origins of Popular Recipes. Athens, Ohio, USA: Ohio University Press. ISBN 0-8214-1232-9. This page was last edited on 4 April 2019, at 13:24 (UTC).